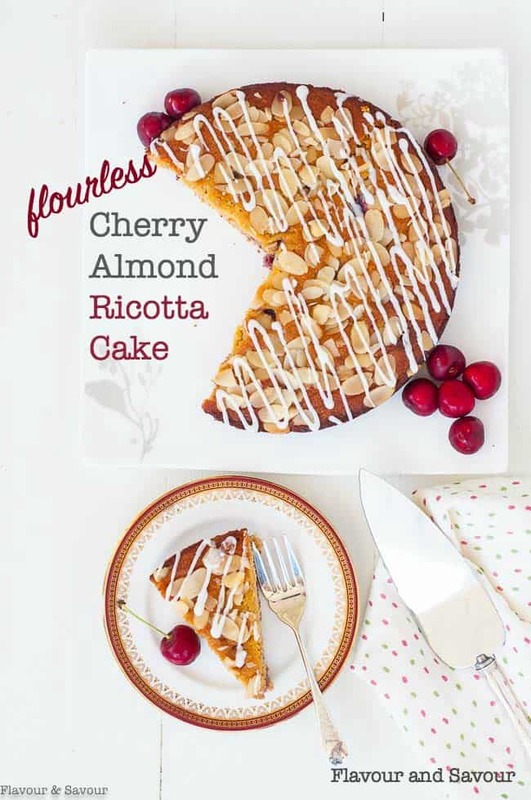 This Flourless Cherry Almond Ricotta Cake is light, delicately almond-flavoured and filled with fresh cherries. It never fails me! 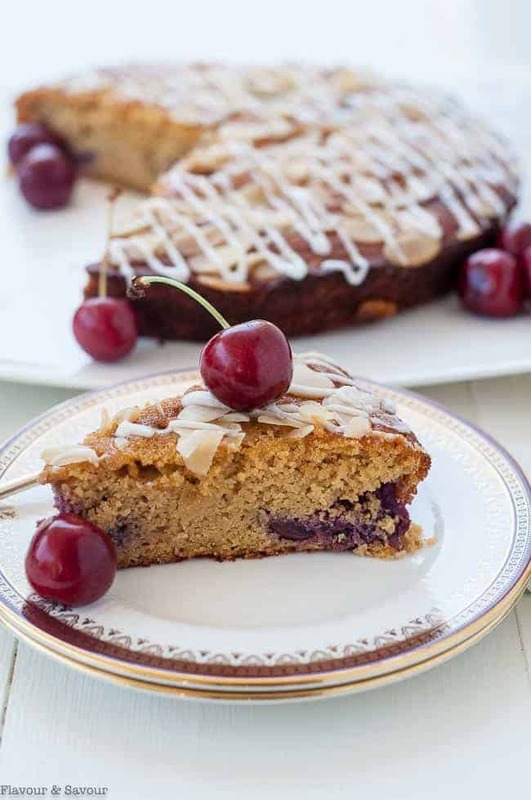 Flourless Cherry Almond Ricotta Cake coming to you today! It was a baking day today, only because we decided not to go boating. It was a beautiful sunny day and it would have been gorgeous out on the water, but we needed a day to catch up around here and do thrilling things like weed-eat the yard, pick the beans, and vacuum the garage. With a mound of cherries from the farm down the road and a tub of ricotta left over from making my 10-Minute Creamy Lemon Ricotta Cherry Parfait, I decided that baking a nice light cherry cake would be a good idea for this summer morning. We apparently both agreed, because Denis and I had it for breakfast! We NEVER eat cake for breakfast (unless we’re in Italy where that seems to be the norm), but today we succumbed to temptation and each devoured a piece. Tomorrow we’ll be back to Baked Oatmeal with Chia and yogurt! 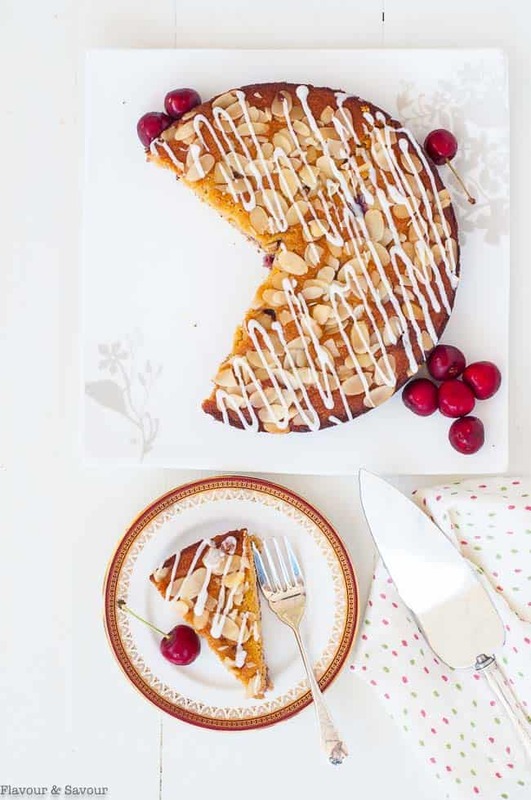 While this Cherry Almond Ricotta Cake was delicious for a late breakfast, I created it as a dessert cake. 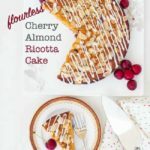 Topped with flaked almonds and a creamy almond glaze, it makes a light dessert. 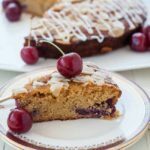 It’s tender and moist and has a light almond flavour and it’s gluten-free. It’s a variation of this Flourless Lemon Almond Ricotta Cake with Blackberry Coulis that we love, too. Line your baking pan with parchment paper when baking gluten-free cakes. It makes it easy to remove the cake from the pan without having it break. Peel off the parchment paper as soon as you remove the cake from the pan as it tends to trap moisture. 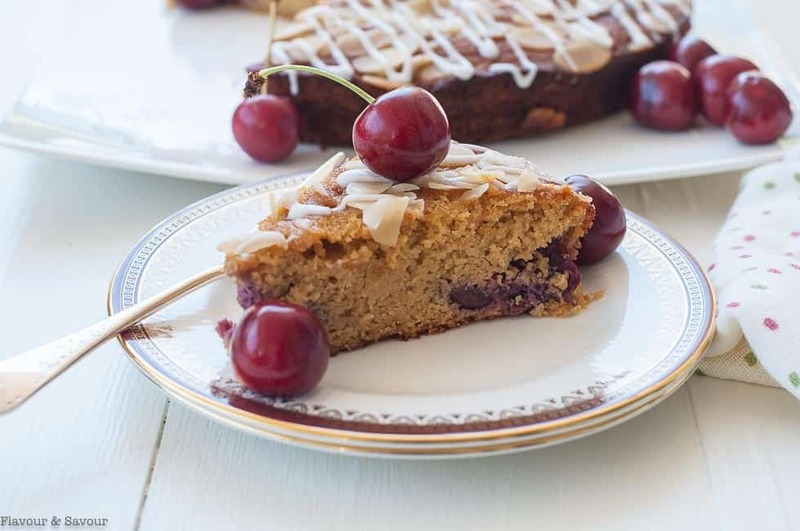 Use the Super-fine (or finely ground) almond flour to keep the cake light. Whisk the almond flour and coconut flour before measuring. Make sure to remove any lumps by passing it through a sieve. Cool the cake completely before slicing to avoid crumbling. It’s hard to wait, but it will be worth it! Preheat oven to 325°F. Cut a circle of parchment paper to fit in the bottom of an 8-inch round pan, or ilne an 8-inch square pan with parchment paper. In a large bowl or the bowl of a stand mixer, (or with a hand mixer) cream the butter, sugar and almond extract until well combined. Add one egg and beat. Add the ricotta and beat. Add 1/3 of the dry ingredients alternatively with an egg, repeating and finishing with the last egg. Gently fold in the sliced cherries. Spread into the lined pan, smoothing the top. Bake for 45 - 50 minutes or until cake tester comes out clean. Remove from the oven and let cool for 20 minutes. Loosen the edges with a knife, lay a cake rack over the pan, invert and remove the parchment paper. Invert back on to the first rack and let stand to cool completely. Trim edges with a sharp knife, if desired, then slice into 8 - 10 pieces. 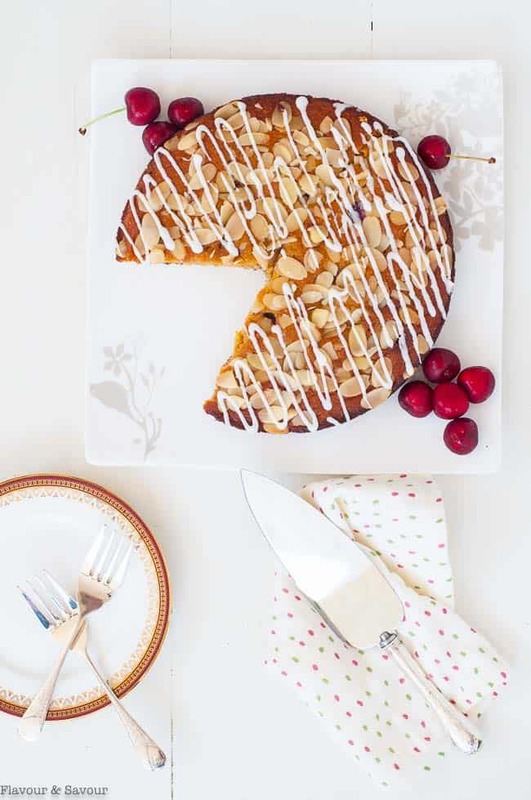 Drizzle with an optional glaze made with 1/2 cup powdered sugar, 1/4 tsp almond extract and 2-3 teaspoons of cream or milk. Store leftover cake in an airtight container or freeze. Ooh, this looks delicious. Cherry and almond is one of my favorite flavors. I’ll be adding this cake to an upcoming party meal plan. I love that flavour combo, too. I’m sure you’ll love this recipe! Great idea! I will go even further and substitute sugar with maple syrup, to make it healthier ) Like that you use coconut flour. Thanks for sharing! This cake is absolutely gorgeous! Cherry and almond pair so nicely together. Great recipe! Thank you for sharing this, I am going to make it but sub the sugar for something that fits into my diet. I pinned it for later. It looks great!